Pulmonary hypertension (PH) is a pathophysiological and hemodynamic condition in which average blood pressure in the pulmonary arteries is greater than 25 mmHg at rest . The current treatments for PH include endothelin receptor antagonists, calcium antagonist, anticoagulant, prostacyclins analogues, and phosphodiesterase 5 inhibitors (PDE-5) . High concentrations of PDE-5 in the pulmonary arteries and its function can cause abnormal growth of vessels and impaired vasodilatation . Tadalafil (TAD), the most potent inhibitor of PDE-5 enzyme, was documented to improve pulmonary hemodynamics. TAD belongs to the biopharmaceutical classification system class II drugs. Inadequate aqueous solubility of TAD caused variations in bioavailability and clinical drug responses . In addition, peroral administration of TAD leads to systemic availability of the drug that results in unwanted side effects. The pulmonary route has received extensive attention as noninvasive method of drug administration for local and systemic drug delivery due to the large surface area, fairly low activity of enzymes, high vascularization, and high permeability owing to extremely thin walls of the alveoli. Furthermore, the possibility to deliver therapeutic agents at high concentrations into site of action by preventing the first-pass metabolism and reduced systemic doses allow efficient treatment of pulmonary disease and minimum drug side effects . The delivery of TAD to the lung could allow safe local treatment, more rapid onset of response and reduced side effects. Nanoparticles (NPs) have gained considerable attention as a carrier for pulmonary delivery due to the ability to penetrate into airway mucosa, while avoiding macrophages and mucociliary clearance. They provide some other advantages, including increase of drug solubility, high drug loading capacity, sustained release property which reduces frequency of dosing and shortens treatment period. NPs also have wider distribution in the lung because of the higher surface area to mass ratio . However, NPs are not suitable for deep lung delivery due to their low inertia causing them to be breathed out after inhalation which may lead to dose variability. In addition, NPs join together to form large aggregate due to their high free surface energy. To avoid these problems, preparation of microscale powder containing NPs, is unavoidable . Sugars, such as lactose or mannitol, have been employed as inert carriers of NPs because they are nontoxic and approved by FDA . After deposition in the lung, the microparticles dissolve and dissociate into primary NPs in the surface of alveoli . Spray drying is known as a scalable process to produce inhalable powder for lung delivery. It is a rapid, single step process that converts very small liquid droplets to dry product of powder with optimum particle characteristics, including size and density suitable for pulmonary delivery . Metered-dose inhalers (MDI), nebulizers, and dry powder inhalers (DPI) are the three main aerosol devices used to deliver therapeutic agents to the lung . Among these, DPI appears to be the most promising because they are propellant-free, portable, easy to operate and cost effective devices with enhanced stability of the formulation upon storage as a result of the dry state . Polymeric nanospheres composed of poly lactide-co- glycolic acid (PLGA) have received a great attention for delivery of a wide variety of therapeutic agents due to its advantages such as biocompatibility, biodegradability, drug release control, drug targeting and lower toxicity compared to other polymers and more stability than liposomes and other drug delivery systems in biological environments ,. In the present study, we have developed an inhalable powder containing TAD-loaded polymeric colloidal formulation for the therapy of PH. The effects of sonication time (S) as a process variable, as well as formulation variables such as aqueous/organic phase ratio (W/O), polymer/drug (P/D) ratio and surfactant concentration on different physicochemical properties of NPs were evaluated. Then, microstructures containing optimized NPs were prepared and the influence of carrier type on the characteristics of the powder was evaluated. TAD was provided by Osvah pharmaceutical company (Iran). PLGA (50:50, molecular weight of 24,000–38,000) and polyvinyl alcohol (PVA, 99% hydrolysis degree and molecular mass 66000 g/mol) were acquired from Sigma-Aldrich (US). Dichloromethane (DCM) of analytical grade was obtained from Merck chemical company (Germany). Dialysis bag was supplied from Sigma-Aldrich (US). Mannitol, leucine and lactose were from Fluka (US). Four different control factors, each at 3 levels were studied in the production of PLGA-NPs by a Taguchi design L9 orthogonal array experiment. Four investigated responses included particle size, zeta potential, entrapment efficiency (EE) and release efficiency. Design expert program (version 10, US) was used for statistical analysis of experimental results. [Table 1] displays formulations studied in the present study. The optimum conditions were determined by the Taguchi optimization method to yield a heightened performance with the lowest possible effect of noise factor. Table 1: Physicochemical properties of TAD-loaded PLGA nanoparticles. TAD-loaded PLGA-NPs (TAD-PLGA- NPs) were prepared by emulsion-solvent evaporation method . 7.5, 12.5 or 25 mg PLGA and 2.5 mg TAD were dissolved in 1 mL of DCM as organic solvent. The organic phase was added dropwise to the different amounts of aqueous phase containing 1%, 2% or 3% PVA as a stabilizer under magnetic stirring at the speed of 800 rpm. Then the obtained coarse emulsion was sonicated for 2, 4 or 6 min using a high-intensity probe ultrasonicator (Bandelin HD 3200; Bandelin Electronics, Berlin, Germany). Finally, the resulting emulsion was stirred under magnetic stirring for 3 h to allow organic solvent evaporation. Particle size, polydispersity index (PDI), and zeta potential of TAD-PLGA-NPs were determined by dynamic light scattering method using Malvern nanosizer (PCS, Zetasizer 3000, Malvern, UK). To determine the release rate of TAD from NPs, an appropriate amount of each formulation was transferred to the dialysis membrane (molecular weight cut off 12000 Da) and were placed in the glass beaker in phosphate buffered saline (PBS, pH 7.4, at 37 oC) containing 2% w/v of Tween 80 to provide sink condition with stirring at 400 rpm. At predetermined time intervals, 1 mL of the sample was taken for analysis and then returned to glass beaker. This experiment was done in triplicate. The amount of drug released was determined using ultraviolet spectrophotometer (UV mini 1240, Shimadzu, Japan) at 291 nm. Drug release data of optimized formulation were fitted with different kinetic models including Baker Lonsdale 3/2 × [1-(1- M/M	∞)23] - Mt/M∞ = kt, Higuchi [(Mt/M∞) = kt12], first order [Ln(1- Mt/M∞) = -kt] , zero order (Mt/M∞ = kt), where M∞ is the total amount of drug loaded in PLGA-NPs that can be released after infinite time, Mt is the amount of drug released at time t, t is sampling time, and k is release constant. The best model was selected based on the highest correlation coefficient (r2). The mechanism of drug release from prepared optimized PLGA-NPs was also evaluated using Korsmeyer-Peppas model (Mt/M∞ =ktn), where n is release exponent. For diffusion controlled systems, n value is equal or less than 0.5. When 0.5 < n < 1, diffusion- erosion is the dominant mechanism of drug release. If n value is close to 1, the drug release is mainly controlled by erosion (or relaxation) ,. To remove the free drug, the final nanosuspension of the optimized formulation was centrifuged at 14000 rpm for 30 min and then precipitated PLGA-NPs were washed twice with water and lyophilized . The final dry powder was taken out for differential scanning calorimetry (DSC) and FTIR study. DSC thermogram of TAD, PLGA, physical mixture, TAD-PLGA-NPs (8-10 mg) were recorded using a DSC instrument (Mettler Toledo, Switzerland) between 10 oC - 350 oC at a heating rate of 10 °C per min. FTIR spectra of drug, PLGA, physical mixture and TAD-PLGA-NPs were recorded on FTIR spectrophotometer (Rayleigh, WQF-510/520, China) using the potassium bromide (KBr) disk method. The FTIR spectra scanned in the IR range from 400 to 4000 cm-1. Optimized formulation in the presence of lactose, mannitol with or without leucine was spray-dried [Table 2] using a Büchi Mini Spray Dryer B290 (Lab Plant SD-05, UK) under the following conditions: inlet temperature of 80 oC , solution flow rate of 2.5 mL/min, outlet temperature 42-49 oC , N2 flow rate of 35 m3/h. The resultant spray dried powders were collected and yield percentage was determined. Then samples were stored in a desiccator at ambient temperature until used for further studies. Table 2: Comparison of predicted and actual values of different responses of the optimized formulation of PLGA NPs. To study in vitro aerosolization characteristics of powders, next generation impactor (NGI, Model 170, Apparatus E; British Pharmacopoeia, 2010, USA) was used. 10 mg of each spray dried powder was filled into hard gelatin capsules (size 3). The capsule was punctured and powder was aerosolized through the next generation impactor using Aerolizer® at flow rate of 60 L /min. All collection surfaces were washed with water and the drug was extracted by DCM. The drug contents in each stage were then determined using a UV spectrophotometer at 272 nm. Each test was repeated 6 times. The percentage of emitted dose (ED), fine particle fraction (FPF), mass median aerodynamic diameter (MMAD) and geometric standard deviation (GSD) were determined from drug deposition data. CITDAS Version 3.10, data processing software (Copley Scientific, Nottingham, UK) was used for determination of these parameters ,. Flowability of the spray-dried powders was determined by measuring the angle of repose, Carr’s compressibility index and Hausner ratio. Angle of repose was determined by a fixed funnel method as described previously. Carr’s compressibility index was measured from the tapped and bulk density of spray- dried powders using equation 3. Bulk density was determined by measuring the volume of a known weight powder in a 10 mL measuring cylinder and tapped density was determined by bulk density measurements following 100 taps. Hausner ratio was determined from tapped density (ρt) and bulk density (ρb) calculated by equation 4. The particle size and size distribution of the spray-dried powder was determined by dynamic laser light scattering (DLS) method using Malvern nanosizer (ZEN3600, Malvern Instruments Ltd, UK). Five mg of each sample was dispersed in hexane or isopropyl alcohol using water bath sonicator for lactose and mannitol containing powder, respectively. The particle size was measured in triplicate . The morphology of the optimized NPs and spray dried powders were evaluated using a scanning electron microscope (SEM, JSM- 5900LV, JEOL, Japan). Particles of each sample were coated with gold under vacuum before imaging. TAD loaded polymeric PLGA-NPs were prepared by emulsion-solvent evaporation method. Effect of different variables, including PLGA content, aqueous/organic phase ratio (W/O ratio), sonication time and surfactant content on different physicochemical properties of PLGA-NPs were evaluated using Taguchi orthogonal design. Contribution of different studied parameters on TAD encapsulation efficiency, particle size, zeta potential and release efficiency of PLGA-NPs is shown in [Figure 1]. As shown in [Figure 1], EE, zeta potential and particle size of PLGA-NPs were more affected by W/O ratio. [Table 1] shows the results of EE, particle size, zeta potential, PDI and RE of studied formulations. The particle size of TAD-PLGA- NPs varied between 35.07 and 301.7 nm. The zeta potential of all formulations was negative and varied between -1.47 and -3.6. The EE of PLGA-NPs ranged from 61.64 to 96.12 %. In vitro drug release profiles from PLGA-NPs are shown in [Figure 2]. 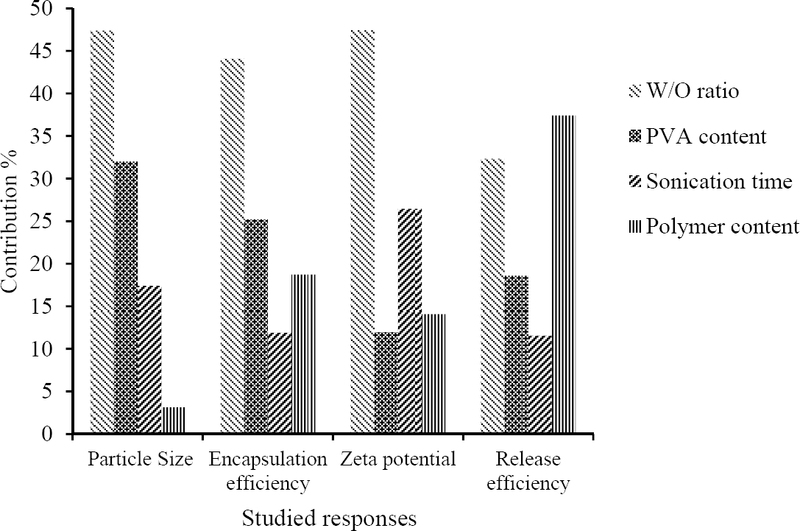 Figure 1: Contribution of different studied parameters on tadalafil encapsulation efficiency, particle size, zeta potential and release efficiency in PLGA-NPs. Figure 2: In vitro release profiles of tadalafil from different studied formulation of PLGA-NPs (mean ± SD, n = 3). The release of TAD from PLGA-NPs was biphasic with an initial burst release followed by slower release manner. The RE24% is directly related to the release rate of the drug from PLGA-NPs. The RE24% ranged between 30.49 ± 9.87 and 77.8 ± 2.01. As it is seen in [Figure 1], the RE24% is more affected by the polymer/drug ratio. For the optimization of the formulation of PLGA-NPs, all responses were fitted to linear model. The constraint of particle size was between 35 < Y1 < 301.7 nm with targeting the particle size in the range of the measured values for the prepared batches. For zeta potential, the constraint was between -1.47 < Y2 < -3.6 nm with targeting the zeta potential on maximum of obtained data. For encapsulation and release efficiency, the constraints were between 61.4 < Y3 < 96.12 % and 30.49 < Y4 < 77.8 %, respectively, with targeting the both on maximum of the measured values. The constraint of PDI was between 0.37 < Y5 < 0.9 with the goal set on a minimum of PDI value. Accordingly, Taguchi’s design suggested the optimized PLGA-NPs processing condition of the TAD- PLGA-NPs with 0.825 desirability. The optimized formulation was prepared using optimized polymer/drug ratio of 3:1, sonication time of 6 min, PVA of 2% and the phase ratio of 10. This formulation was prepared and its particle size, zeta-potential, EE, PDI, and RE were determined. [Table 2] shows the predicted and measured values of all responses. The results showed the predicted values by the software were close to the actual values, indicating that the Taguchi design can successfully predict the best situation of preparing the stable TAD-PLGA-NPs. The SEM images reveal that TAD-PLGA- NPs are spherical with smooth surface ([Figure 3]a,[Figure 3]b). The size of PLGA-NPs determined by SEM was smaller than that obtained by zeta sizer. The larger particle size obtained by zeta sizer might be attributed to hydrodynamic layers covering the particles in solution while for SEM, the samples are in dehydrated state. Figure 3: Scanning electron microscope (SEM) micrographs of (a), and (b), tadalafil loaded PLGA-NPs; dry powders containing tadalafil loaded PLGA-NPs prepared by (c) mannitol, (d) mannitol/leucine (8:1), (e) lactose, (f) lactose/leucine (8:1). Release data of the optimized formulation were fitted to different kinetic models. Considering the highest correlation coefficient, it was concluded that the drug release pattern of the optimized formulation follows the zero order kinetic (R2 = 0.98). The mechanism responsible for drug release from biodegradable PLGA-NPs may be degradation of the polymer matrix of PLGA-NPs or diffusion of drug molecules through the matrix or the combination of both processes. Calculated release exponent in the optimized formulation was about 0.9 indicates that the release was mainly controlled by erosion. To determine the physical status of drug in the PLGA-NPs, DSC analysis was conducted. [Figure 4] shows the DSC thermogram of pure TAD, PLGA, TAD-PLGA-NPs, physical mixtures of blank PLGA-NPs and pure TAD. [Figure 4] FTIR and differential scanning calorimetry (DSC) thermogram of (a) tadalafil, (b) PLGA, (c) physical mixture of tadalafil and blank NPs, (d) tadalafil loaded NPs. The DSC thermogram of TAD showed a sharp endothermic peak of melting at 304 oC indicating its crystalline state. The PLGA thermogram showed glass transition temperature around 52 oC. It can be observed from DSC thermograms that the glass transition temperature of the PLGA was not influenced by microencapsulation procedure. Physical mixture of blank PLGA-NPs and the drug showed a melting peak, which corresponds to the melting temperature of pure TAD. 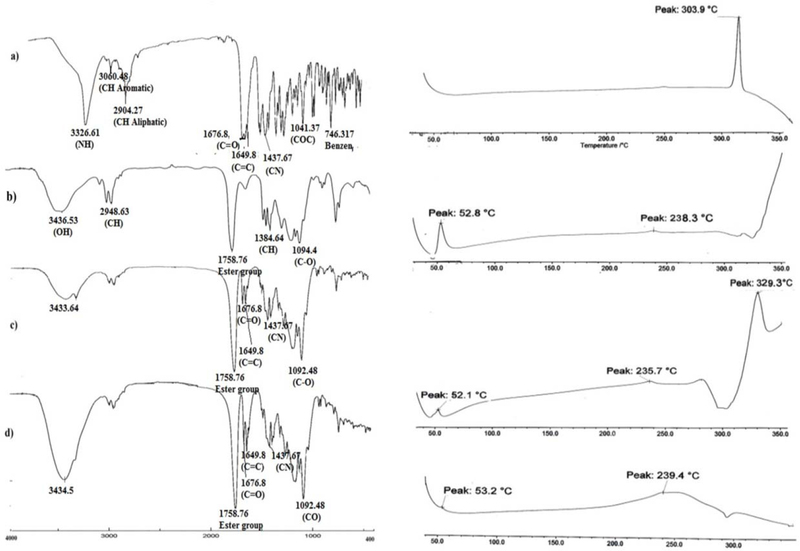 The nano-formulation showed no peaks corresponding to melting point of TAD in the DSC curve due to decreased drug crystallinity in the formulations and /or drug solvation in the polymeric matrix after fabrication. Similar results were reported by other authors when other hydrophobic drugs were encapsulated in PLGA-NPs . Figure 4: FTIR and differential scanning calorimetry (DSC) thermogram of (a) tadalafil, (b) PLGA, (c) physical mixture of tadalafil and blank NPs, (d) tadalafil loaded NPs. The FTIR spectrum of TAD showed characteristic bands at 3326.6 cm-1 (N-H stretch, secondary amine), 3060 cm-1 (C-H stretch, aromatic), 2904 cm-1 (C-H stretch, aliphatic CH3), 1676 cm-1 (C-O carbonyl), 1649.8 cm-1 (C-C aromatic), 1437 cm-1 (C-N stretch), 1041 cm-1 (C-O-C) and 746.317 cm-1 (benzene). The FTIR spectrum of PLGA showed peaks at 3433.64 cm-1 (O-H stretch), 1758 cm-1 (ester group), 1384.64 cm-1 (bending C-H vibrations) and 1095.37 cm-1 (C-O stretch). The physical mixture of blank PLGA-NPs and TAD and TAD-PLGA-NPs showed all characteristic bands of TAD and PLGA that were identified in the isolated compounds in the IR spectra with smaller intensity [Figure 4]. The result indicated no chemical interaction between drug and polymer during preparation of PLGA-NPs. [Table 3] shows the aerodynamic properties of the dry powder containing TAD-PLGA-NPs co-spray dried with lactose or mannitol with and without leucine. All spray-dried powders showed high percentage of emitted dose (more than 90%) and there was no significant difference between different studied powders. The data presented in [Table 3] showed that the one prepared from optimized formulation and lactose revealed better aerodynamic properties than that obtained from mannitol. 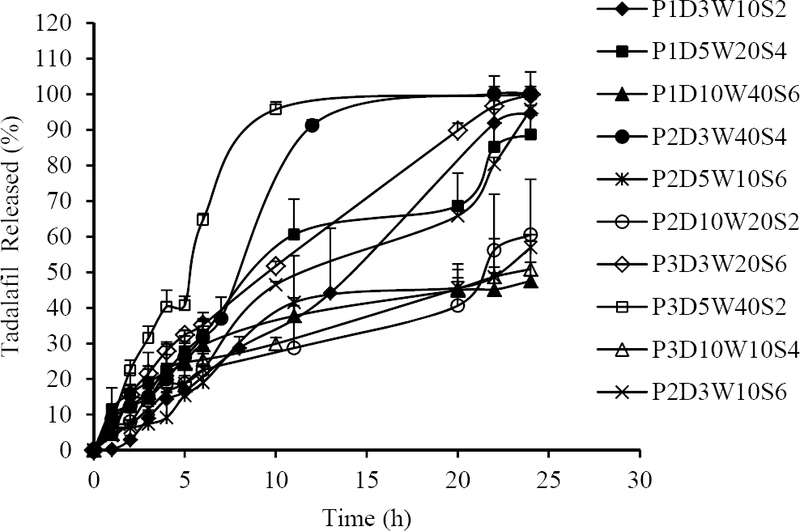 As shown in [Table 3], incorporation of leucine in mannitol containing formulation reduced cohesiveness and significantly improved the deposition profile of PLGA-NPs. The spray dried powders were evaluated for their flow properties in terms of Carr's index, angle of repose and Hausner ratio. As shown in [Table 3], the angle of repose and Carr's index ranged between 21.59 to 25.85 and 12.08 to 16.53, respectively. The results revealed good flow properties of the powder. This was further confirmed by Hausner ratio. The incorporation of leucine in excipients have no significant effects on flow properties of the powders. [Figure 3]e,[Figure 3]f shows the SEM micrograph of spray dried powders containing lactose and mannitol with or without leucine. The spray dried powders containing lactose and mannitol exhibited spherical particles with smooth surface. The addition of leucine changed the smooth surface of PLGA-NPs to a rough surface that may be attributed to earlier precipitation of leucine with lower solubility in the drying process . Statistical analysis using Design Expert Software showed the most effective factor on particle size was W/O phase ratio. With decreasing organic/aqueous phase ratio from 1:10 to 1:20 (v/v), an increase in mean particle size was observed. However, further increase in aqueous phase volume decreased the particle size. This may be due to a decrease in viscosity and attractive forces between the molecules (P < 0.05) . To achieve an emulsified system, the addition of energy is an essential step . To evaluate the effect of sonication time on PLGA-NPs diameter, sonication time was increased from 2 to 6 min. Increase in sonication time from 2 to 4 min led to a decrease in the size of the particles (P < 0.05), however, further sonication (6 min) did not change the particle size significantly. The particle size initially showed an increase with the increase of PVA content. Further increase in PVA content decreased particle size and PDI (P < 0.05). This is due to the increased concentration of PVA stabilizing the polymer droplets well enough to protect them against coalescence . There was no significant increase in particle size as polymer/drug ratio increased (P > 0.05). The stability of colloidal dispersion depends on zeta potential and enhances with increase in value of zeta potential. Because of small absolute zeta potential, these formulations may be susceptible to aggregation in colloidal dispersion state, however, since final prepared dosage form is prepared as dry powder inhaler containing PLGA-NPs co-spray dried with sugar-based carrier, this is not considered as a limitation . All formulations showed a negative zeta potential. The negative charge is attributed to ionization of the carboxyl groups of PLGA polymer on the surface of PLGA-NPs . The absolute zeta potential of PLGA-NPs increased as aqueous/organic phase ratio increased (P < 0.05). By increasing the sonication time (though not significant), the absolute value of zeta potential increased too. All these changes reduced the particle size of PLGA-NPs. As the particle size decreased, surface charge increased, as a result absolute value of zeta potential increased . The results indicate that an increase in surfactant content reduced the negative zeta potential of PLGA-NPs (P > 0.05). This may be attributed to nonionic nature of surfactant. Its adsorption on the surface of PLGA-NPs could reduce their surface charge . [Table 3] shows that the EE of PLGA-NPs changed between 61.64 to 96.12 %. Increasing the aqueous phase volume, decreased EE. It has been postulated that the amount of drug diffused in aqueous phase increased with increasing the volume of aqueous phase (P < 0.05) . EE decreased as PVA content increased which could be explained by increasing the solubility of drug (P < 0.05); as a consequence, drug loss was observed when oil phase was in a semisolid state before polymer hardening. This result was in agreement with previous data reported by Hadipour Moghaddam, et al. . Increasing polymer/drug ratio has increased the EE of PLGA-NPs (P > 0.05). This may be due to the increase in viscosity of internal phase that inhibits drug migration to external phase and therefore increasing drug EE . By increasing the sonication time (though not significant), the EE of PLGA-NPs was slightly increased. Emami, et al. also reported similar result in incorporation of celecoxib in polymeric NPs of PLGA. This could be due to the decreased diffusion of the drug to aqueous media and rapid polymer hardening caused by fast loss of oil phase due to the evaporation at higher sonication time. Unidirectional and less turbulent flow in lower speed also caused migration of drug from the organic phase . None of studied factors contribute significantly to the release efficiency of PLGA-NPs. The cumulative amount of drug released at 24 h, decreased with an increase in polymer concentration. The decrease in release rate can be attributed to increased concentration of the polymer content of PLGA-NPs, which hinders the drug release by diffusion . The RE24% of PLGA-NPs exhibited an increase when the aqueous phase volume increased. Enhanced RE24% of PLGA- NPs may be due to a reduction in particle size. Smaller particles showed a faster rate of drug release because of the shorter diffusion path length that the drug had to move to achieve release media . Upon increasing the surfactant content, the amount of drug solubilized in aqueous phase increased, thereby increasing the RE24% from PLGA- NPs . The RE24% was slightly decreased by increasing sonication time. The reason for decreased RE24% at higher sonication time could be due to the formation of a more stable matrix by fast loss of oil phase at higher sonication time. Particle size is one of the most important factors that influence on the site of deposition and the mass of inhaled drug that deposit in the lung. In order to reach the deep lung and optimize systemic drug absorption, MMAD should be between 1 and 3 μm . The MMAD for spray dried TAD-PLGA-NPs ranged between 1.45 and 2.8 μm indicating the potential of the prepared particles for DPI application. The lowest FPF obtained for powder containing mannitol could be due to highly cohesive properties of mannitol . It has been reported that incorporation of leucine into a precursor solution for spray-drying could improve aerosolization and performance of dry powder . To take benefit of this feature of leucine, PLGA-NPs were co-spray dried with sugar in the presence of leucine. By adding leucine to mannitol containing formulation, MMAD and GSD decreased, thereby resulting a better in vitro deposition. In addition, process yield improved as an effect of the presence of leucine in spray dried powders. Leucine has been reported to have anti-adherent and surface active properties. As a consequence, it has a good tendency to assemble on the surface of droplets with their hydrocarbon chains to reduce surface cohesiveness . It has been shown that amino acid with non-polar side chain (e.g. leucine, phenylalanine, methionine and tryptophan) provides higher particle surface coverage after spray drying than amino acids with polar side chain (e.g. asparagine and arginine) . In contrast, in formulation containing lactose, leucine incorporation did not show any effect on FPF and MMAD. This is somewhat in opposition to previous studies that showed the addition of leucine could improve aerosolization of spray-dried particles with lactose . Increase the concentration of leucine in the formulation or/and reduce its solubility in solvent system may increase surface concentration of leucine leading to increase leucine effectiveness to improve aerosol performance. TAD-PLGA-NPs were prepared successfully by emulsion solvent evaporation method. TAD-loaded optimized PLGA-NPs were spherical with an average particle size of 240.43 nm and PDI of 0.31. TAD-loaded polymeric PLGA-NPs showed sustained release behavior during 24 h. The results revealed that encapsulation efficiency, zeta potential and particle size of PLGA-NPs were more affected by aqueous/organic phase ratio, while release efficiency was more affected by the polymer/drug ratio. The addition of 10% leucine in formulation containing mannitol had significant effects on the process yield as well as aerodynamic properties of the powders. A good in vitro aerosolization performance of developing DPI containing TAD-PLGA-NPs suggests these powders would be predominately deposited in deep regions of the lung following inhalation. The content of this paper is extracted from the Pharm. D thesis NO. 295085 submitted by Razieh Vatankhah that was financially supported by the Novel Drug Delivery Systems Research Center of Isfahan University of Medical Sciences, Isfahan, I.R. Iran. Ramakrishnan S. Current concepts in management of pulmonary hypertension: fighting the old demon with modern weapons. Indian J Pediatr. 2015;82(12):1128-1134. Ghasemian E, Vatanara A, Rouini MR, Rouholamini Najafabadi A, Gilani K, Lavasani H, et al. Inhaled sildenafil nanocomposites; lung accumulation and pulmonary pharmacokinetics. Pharm Dev Technol. 2016;21(8):961 -971. Baek JS, Pham CV, Myung CS, Cho CW. Tadalafil- loaded nanostructured lipid carriers using permeation enhancers. Int J Pharm. 2015;495(2):701-719. Hassanpour Aghdam M, Ghanbarzadeh S, Javadzadeh Y, Hamishehkar H. Aggregated nanotransfersomal dry powder inhalation of itraconazole for pulmonary drug delivery. Adv Pharm Bull. 2016;6(1):57-64. Iyer R, Hsia CC, Nguyen KT. Nano-therapeutics for the lung: state-of-the-art and future perspectives. Curr Pharm Des. 2015;21(36):5233-5244. Li YZ, Sun X, Gong T, Liu J, Zuo J, Zhang ZR. Inhalable microparticles as carriers for pulmonary delivery of thymopentin-loaded solid lipid nanoparticles. Pharm Res. 2010;27(9):1977-1986. Bohr A, Water J, Beck-Broichsitter M, Yang M. Nanoembedded microparticles for stabilization and delivery of drug-loaded nanoparticles. Curr Pharm Des. 2015;21(40):5829-5844. 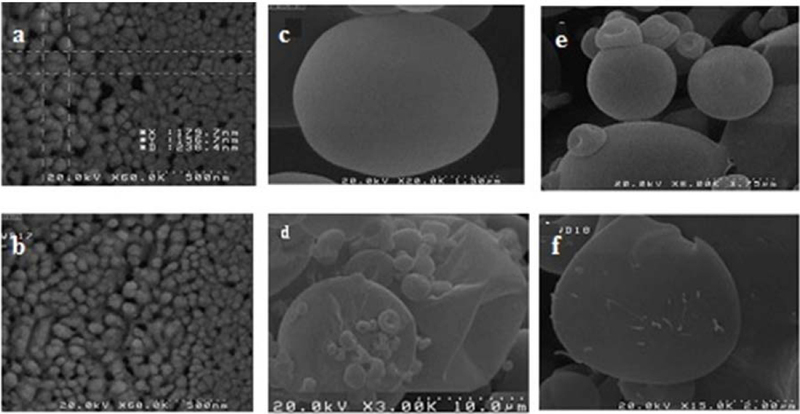 Emami J, Pourmashhadi A, Sadeghi H, Varshosaz J, Hamishehkar H. Formulation and optimization of celecoxib-loaded PLGA nanoparticles by the Taguchi design and their in vitro cytotoxicity for lung cancer therapy. Pharm Dev Technol. 2014:110. Hadipour Moghaddam P, Ramezani V, Esfandi E, Vatanara A, Nabi-Meibodi M, Darabi M, et al. Development of a nano-micro carrier system for sustained pulmonary delivery of clarithromycin. Power Technol. 2013;239:478-83. Varshosaz J, Taymouri S, Hamishehkar H. Fabrication of polymeric nanoparticles of poly (ethylene-co-vinyl acetate) coated with chitosan for pulmonary delivery of carvedilol. J Appl Polym Sci. 2014;131(1). Taymouri S, Varshosaz J, Hassanzadeh F, Haghjooy Javanmard S, Dana N. Optimisation of processing variables effective on self-assembly of folate targeted Synpronic-based micelles for docetaxel delivery in melanoma cells. IET Nanobiotechnol. 2015;9(5):306-313. Mashak A, Mobedi H, Mahdavi H. A Comparative Study of Progesterone and Lidocaine Hydrochloride Release from Poly (L-lactide) Films. Pharm Sci. 2015;21(2):77-85. Gómez-Gaete C, Tsapis N, Besnard M, Bochot A, Fattal E. Encapsulation of dexamethasone into biodegradable polymeric nanoparticles. Int J Pharm. 2007;331(2):153-159. Emami HM, Hamishehkar H, Varshosaz J. Formulation and optimization of solid lipid nanoparticle formulation for pulmonary delivery of budesonide using Taguchi and Box-Behnken design. Res Pharm Sci. 2014;10(1):17-33. Javadzadeh Y, Ahadi F, Davaran S, Mohammadi G, Sabzevari A, Adibkia K. Preparation and physicochemical characterization of naproxen- PLGA nanoparticles. Colloids Surf B. 2010;81(2):498-502. Amaro MI, Tewes F, Gobbo O, Tajber L, Corrigan OI, Ehrhardt C, et al. Formulation, stability and pharmacokinetics of sugar-based salmon calcitonin- loaded nanoporous/nanoparticulate microparticles (NPMPs) for inhalation. Int J Pharm. 2015;483(1- 2):6-18. Iqbal M, Valour JP, Fessi H, Elaissari A. Preparation of biodegradable PCL particles via double emulsion evaporation method using ultrasound technique. Colloid Polym Sci. 2015;293(3):861-873. Tripathi A, Gupta R, Saraf SA. PLGA nanoparticles of anti tubercular drug: drug loading and release studies of a water in-soluble drug. Int J Pharm Tech Res. 2010;2(3):2116-2123. Gupta H, Aqil M, Khar RK, Ali A, Bhatnagar A, Mittal G. Biodegradable levofloxacin nanoparticles for sustained ocular drug delivery. J Drug Target. 2011;19(6):409-417. Duxfield L, Sultana R, Wang R, Englebretsen V, Deo S, Swift S, et al. Development of gatifloxacin- loaded cationic polymeric nanoparticles for ocular drug delivery. Pharm Dev Technol. 2016;21(2):172- 179. Sharma N, Madan P, Lin S. Effect of process and formulation variables on the preparation of parenteral paclitaxel-loaded biodegradable polymeric nanoparticles: A co-surfactant study. Asian J Pharm Sci. 2016;11(3):404-416. Manoochehri S, Darvishi B, Kamalinia G, Amini M, Fallah M, Ostad SN, et al. Surface modification of PLGA nanoparticles via human serum albumin conjugation for controlled delivery of docetaxel. Daru. 2013 17;21(1):58. Bosquillon C, Rouxhet PG, Ahimou F, Simon D, Culot C, Préat V, et al. Aerosolization properties, surface composition and physical state of spray- dried protein powders. J Control Release. 2004;99(3):357-367. Wang L, Zhang Y, Tang X. Characterization of a new inhalable thymopentin formulation. Int J Pharm. 2009;375(1):1-7. Sou T, Orlando L, McIntosh MP, Kaminskas LM, Morton DA. Investigating the interactions of amino acid components on a mannitol-based spray-dried powder formulation for pulmonary delivery: a design of experiment approach. Int J Pharm. 2011;421(2):220-229. Lechuga-Ballesteros D, Charan C, Stults CL, Stevenson CL, Miller DP, Vehring R, et al. Trileucine improves aerosol performance and stability of spray-dried powders for inhalation. J Pharm Sci. 2008;97(1):287-302.